Sagan, Kubrick, Aldrin, Oh My! The only thing missing from this story now is Kevin Bacon! What's all the Buzz about!? 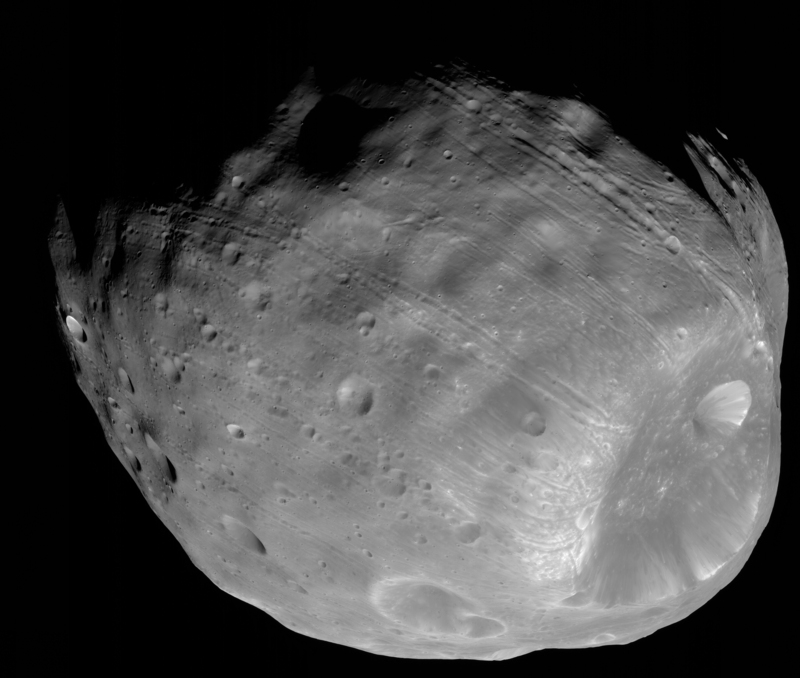 The Mars and Phobos Monoliths may be old news to some, but for me it was something I hadn't looked into much until recently. But, after seeing a bizarre C-SPAN clip featuring Apollo 11 astronaut Buzz Aldrin talking about a monolith on the moon of Mars, my interest was piqued again. After listening to Buzz rave about the Mars moon monolith, I began reading various internet articles about the topic, but the lack of detail in everything I found was leaving me less than satisfied. There were multiple images being thrown around from various space missions and often no references or links to the source images were provided. No one article out there really brought it all together. So, after about two days of non-stop searching through various articles and cryptic government websites and struggling with raw image formats, I'm finally able to lay it all out. First, let us travel back in time to 1966 and take a quick look at a book called "Intelligent Life in the Universe" written by astrophysicist I. S. Shklovskii and the famous Cornell University professor, Carl Sagan. This book was based largely in part on I. S. Shklovskii's early work from 1962 under the title "The Universe, Life and Mind". So, as far back as 1962 to 1966, we have an astrophysicist and the late great Carl Sagan promoting the idea of Mar's moon Phobos being possibly artificial. If that's not mind blowing, then I don't know what is! Next, let's jump ahead a few years and take a look at possibly the greatest science fiction film of all time and the genesis of the Moon monolith idea. That film is Stanley Kubrick's 1968 film "2001: A Space Odyssey". In this iconic film, monoliths are solid black artificial objects of extraterrestrial origin. The first monolith in the film is seen in prehistoric times and is shown to somehow influence the evolution of early man. As the film progresses, scientists discover a magnetic anomaly on the Moon, which turns out to be another mysterious black monolith buried below the lunar surface. Once uncovered, the monolith on the Moon transmits a signal to Jupiter which leads to a 3rd monolith in orbit around Jupiter. This 3rd monolith is some kind of portal or star gate to another world or dimension. In short, go and watch the movie if you haven't already. In an interview in 1969, Kubrick explains the idea of the black monolith. Now, let's go "Back to the Future" nearly 3 decades to September 11th, 1997 (I'm not making this date up, I swear). This is when the Mars Global Surveyor (MGS) arrived at Mars. On September 12th 1998, almost exactly one year after its arrival, MGS snapped several high resolution images of the Martian moon Phobos. In one of those images, (MOC image 55103), you can see an object that appears to be a rectangular monolith sticking straight up out of the ground and casting a long shadow. I believe this to be the object that Buzz Aldrin was referring to on his C-Span interview on July 19th, 2009. The above enhancement was created by first opening the original image file "sp255103.img" using a software application called NASAView Image Display Software. Using NASAView allowed me to save the .img file as a high resolution .GIF image file. Then using Photoshop, I adjusted the brightness and contrast and enlarged the monolith to 200 percent. The monolith in this image is a massive object. The resolution of this image is listed as 2.43m/pixel, and my educated guess is that the object is something near 48m across(~150ft) and maybe 300 ft. tall. The height of the object is more difficult to determine due to the nearly overhead view of the object. Lunar Explorer Italia made some of its own enhancements of this monolith as well and posted the following image on April 18th, 2012. Now we are starting to see just what the "Buzz" is all about! A monolith as big as a skyscraper on the Martian moon Phobos, it doesn't get any cooler than that! Or, Does it? Let's skip ahead a bit to 2009, where on August 6th, the Daily Mail published an article titled "Buzz Aldrin stokes the mystery of the monolith on Mars". The article mainly pushes the "unremarkable boulder" theory with some scientific techno-babble. The article then goes on to state that the Canadian Space Agency wants to land a mission next to the monolith! What!? I thought it was just a boulder!? So, to summarize in layman's terms, the monolith is an "unremarkable boulder" but, the Canadian Space Agency wants to spend hundreds of millions of dollars to look at it up close because it's also the lynch pin of how Phobos was formed (or built) and people who think it's a rectangular object are delusional. 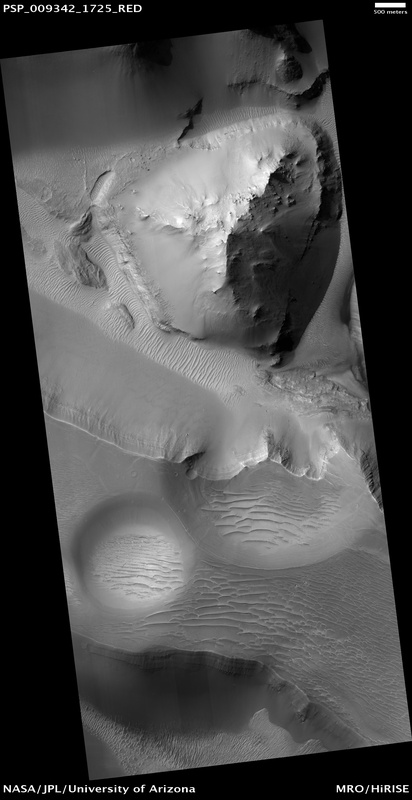 Anyway, moving on (or back) to 2008 brings us to the High Resolution Imaging Science Experiment (HiRise). Those data are not missing; they do not exist for those particular images because they are not true Mars observations. 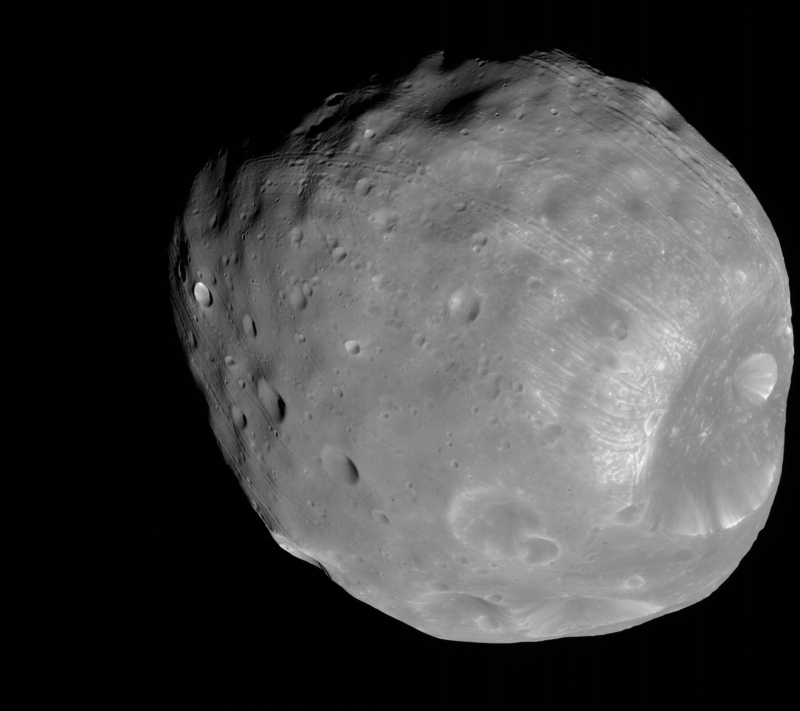 These observations are of Phobos, which means we could not generate the same type of image files we do as when we are imaging the planet itself. Are you still with me? Let's jump ahead again but only a few months this time to July 24th, 2008. This is when HiRise takes an amazing super high resolution image of the Martian surface titled "Boulders and Layers in Canyon" (PSP_009342_1725). The beautifully detailed landscape in this mega image is awesome enough, but it gets better. Zoom into one little tiny area and there it is, the Mars Monolith, not to be confused with the Phobos monolith(s)! See our enhancements of the monolith below. We used Photoshop CS6 with the j2k plugin in order to view the original .JP2 image file (PSP_009342_1725_RED.JP2 - 674.8MB). The resolution of the image is listed as 25 cm/pixel which would make the monolith about 8 ft. across and maybe 16 feet tall (Not too far off from the size of the black monolith from 2001: A Space Odyssey). Interestingly enough there are actually 3 possibly rectangular objects in close proximity to each other, which consequently happens to form a triangle that points North. Probably just "unremarkable boulders" though! Maybe the CSA will want to land next to these rocks one day as well? Last but not least, Lunar Explorer Italia found a Mars monolith of its own and made its own enhancements seen below. This monolith seen below is not the same monolith from HiRise image PSP_009342_1725. Every article out there on the web keeps getting the origin of this image below completely wrong or confused. I took the time to actually contact Lunar Explorer Italia and find out where this image came from. The monolith below posted by Lunar Explorer Italia is from MRO HiRise image PSP_006737_1265 titled "Monitoring Short Temporal Change in Dust Devil Tracks"
The HiRise .jp2 file for image PSP_006737_1265 can be downloaded here (very large file 1GB). The location of the monolith has been circled in the image below for those of you who want to take a look for yourself. Well, there you have it. Everything you wanted to know about the Mars monoliths. I know it was a lot to digest but I hope it was worth it. If you can read this sentence, you are a trooper for sure!